Hugo Alvar Henrik Aalto (pronounced [ˈhuɡo ˈɑlʋɑr ˈhenrik ˈɑːlto]; 3 February 1898 – 11 May 1976) was a Finnish architect and designer. His work includes architecture, furniture, textiles and glassware, as well as sculptures and paintings, though he never regarded himself as an artist, seeing painting and sculpture as "branches of the tree whose trunk is architecture." Aalto's early career runs in parallel with the rapid economic growth and industrialization of Finland during the first half of the twentieth century and many of his clients were industrialists; among these were the Ahlström-Gullichsen family. The span of his career, from the 1920s to the 1970s, is reflected in the styles of his work, ranging from Nordic Classicism of the early work, to a rational International Style Modernism during the 1930s to a more organic modernist style from the 1940s onwards. What is typical for his entire career, however, is a concern for design as a Gesamtkunstwerk, a total work of art; whereby he – together with his first wife Aino Aalto – would design not just the building, but give special treatments to the interior surfaces and design furniture, lamps, and furnishings and glassware. 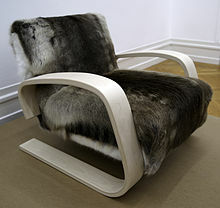 His furniture designs are considered Scandinavian Modern, in the sense of a concern for materials, especially wood, and simplification but also technical experimentation, which led to him receiving patents for various manufacturing processes, such as bent wood. The Alvar Aalto Museum, designed by Aalto himself, is located in what is regarded as his home city Jyväskylä. The signature of Alvar Aalto on the wall of Jyväskylä's theatre building. Auditorium of the Viipuri Municipal Library in the 1930s. Hugo Alvar Henrik Aalto was born in Kuortane, Finland. His father, Johan Henrik Aalto, was a Finnish-speaking land-surveyor and his mother, Selma Matilda "Selly" (née Hackstedt) was a Swedish-speaking postmistress. When Aalto was 5 years old, the family moved to Alajärvi, and from there to Jyväskylä in Central Finland. He studied at the Jyväskylä Lyceum school, where he completed his basic education in 1916, and took drawing lessons from a local artist named Jonas Heiska. In 1916, he then enrolled to study architecture at the Helsinki University of Technology. His studies were interrupted by the Finnish Civil War, which he fought in. He fought on the side of the White Army and fought at the Battle of Länkipohja and the Battle of Tampere. He built his first piece of architecture while still a student, a house for his parents, at Alajärvi. Afterwards, he continued his education, graduating in 1921. In the summer of 1922 he began his official military service, finishing at the Hamina reserve officer training school, and was promoted to reserve second lieutenant in June 1923. In 1920, while still a student, Aalto made his first trip abroad, travelling via Stockholm to Gothenburg, where he even briefly found work with the architect Arvid Bjerke. In 1922, he accomplished his first independent piece at the Industrial Exposition in Tampere. In 1923, he returned to Jyväskylä, where he opened his first architectural office under the name 'Alvar Aalto, Architect and Monumental Artist'. At that same time he also wrote articles for the Jyväskylä newspaper Sisä-Suomi under the pseudonym Remus. During this time, he designed a number of small single-family houses in Jyväskylä, and the office's workload steadily increased. On October 6, 1924, Aalto married architect Aino Marsio; their honeymoon journey to Italy was Aalto's first trip there, though Aino had previously made a study trip there. The latter trip together sealed an intellectual bond with the culture of the Mediterranean region that was to remain important to Aalto for the rest of his life. On their return, they continued with a number of local projects, notably the Jyväskylä Worker's Club, which incorporated a number of motifs which they had studied during their trip, most notably the decorations of the Festival hall modelled on the Rucellai Sepulchre in Florence by Leon Battista Alberti. Following winning the architecture competition for the Southwest Finland Agricultural Cooperative building in 1927 the Aaltos moved their office to Turku. They had made contact with the city's most progressive architect, Erik Bryggman, already before moving, and they then began collaborating with him, most notably on the Turku Fair of 1928-29. Aalto's biographer, Göran Schildt, claimed that Bryggman was the only architect with whom Aalto cooperated as an equal. With increasing works in the Finnish capital, the Aaltos' office moved again in 1933 to Helsinki. The Aaltos designed and built a joint house-office (1935–36) for themselves in Munkkiniemi, Helsinki, but later (1954–56) had a purpose-built office erected in the same neighbourhood – nowadays the former is a "home museum" and the latter the premises of the Alvar Aalto Academy. In 1926, the young Aaltos designed and had built for themselves a summer cottage in Alajärvi, Villa Flora. Aino Aalto died of cancer in 1949. Aino and Alvar Aalto had two children, a daughter, Johanna "Hanni", Mrs Alanen (born 1925), and a son, Hamilkar Aalto (born 1928). In 1952, Aalto married architect Elissa Mäkiniemi (died 1994), who had been working as an assistant in his office. In 1952, he designed and built a summer cottage, the so-called Experimental House, for himself and his new wife in Muuratsalo in Central Finland. 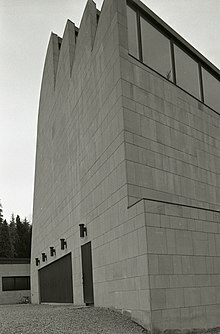 Alvar Aalto died on 11 May 1976, in Helsinki, and is buried in the Hietaniemi cemetery in Helsinki. His wife and the office employees continued the works of the office which were still in progress. In 1978 the Museum of Finnish Architecture in Helsinki arranged a major exhibition of Aalto's works. Although he is sometimes regarded as among the first and most influential architects of Nordic modernism, a closer examination of the historical facts reveals that Aalto (while a pioneer in Finland) closely followed and had personal contacts with other pioneers in Sweden, in particular Gunnar Asplund and Sven Markelius. What they and many others of that generation in the Nordic countries had in common was that they started off from a classical education and were first designing classical architecture, though what historians now call Nordic Classicism – a style that had been a reaction to the previous dominant style of National Romanticism – before moving, in the late 1920s, towards Modernism. Upon returning to Jyväskylä in 1923 to establish his own architect's office, Aalto busied himself with a number of single-family homes, all designed in the Nordic Classicism style, such as the manor-like house for his mother's cousin Terho Manner in Töysa in 1923, a summer villa for the Jyväskylä chief constable in 1923 and the Alatalo farmhouse in Tarvaala in 1924. During this period he also completed his first public buildings, the Jyväskylä Workers' Club in 1925, the Jyväskylä Defence Corps building in 1926 and the Seinäjoki Defence Corp building in 1924–29. He entered several architectural competitions for prestigious state public buildings, both in Finland and abroad, including the two competitions for the Finnish Parliament building in 1923 and 1924, the extension to the University of Helsinki in 1931, and the building to house the League of Nations in Geneva, Switzerland, in 1926–27. Furthermore, this was the period when Aalto was most prolific in his writings, with articles for professional journals and newspapers. Among his most well-known essays from this period are "Urban culture" (1924), "Temple baths on Jyväskylä ridge" (1925), "Abbé Coignard's sermon" (1925), and "From doorstep to living room" (1926). 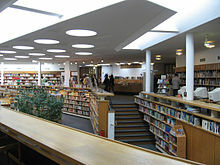 The shift in Aalto's design approach from classicism to modernism is epitomised by the Viipuri Library in Vyborg (1927–35), which went through a transformation from an originally classical competition entry proposal to the completed high-modernist building. Yet his humanistic approach is in full evidence in the library: the interior displays natural materials, warm colours, and undulating lines. Due to problems over financing and a change of site, the Viipuri Library project lasted eight years, and during that same time he also designed the Standard Apartment Building (1928-29) in Turku, Turun Sanomat Building (1929–30) and Paimio Sanatorium (1929–32). A number of factors heralded Aalto's shift towards modernism: on a personal level, Aalto's increased familiarization of international trends especially after travelling throughout Europe, but in terms of completed projects it was the client of the Standard Apartment Building giving Aalto the opportunity to experiment with concrete prefabrication, the cutting-edge Corbusian form language of the Turun Sanomat Building, and these were then carried forward both in the Paimio Sanatorium and in the ongoing design for the library. Although the Turun Sanomat Building and Paimio Sanatorium are comparatively pure modernist works, they too carried the seeds of his questioning of such an orthodox modernist approach and a move to a more daring, synthetic attitude. It has been pointed out that the planning principle for Paimio Sanatorium - the splayed wings - was indebted to the Zonnestraal Sanatorium (1925-31) by Jan Duiker, which Aalto visited while it was still under construction. But while these early Functionalist works by Aalto bear hallmarks of influences from Le Corbusier, Walter Gropius and other key modernist figures of central Europe, in all these buildings Aalto nevertheless started to show his individuality in a departure from such norms with the introduction of organic references. Through Sven Markelius, Aalto became a member of the Congres Internationaux d'Architecture Moderne (CIAM), attending the second congress in Frankfurt in 1929 and the fourth congress in Athens in 1933, where he established a close friendship with László Moholy-Nagy, Sigfried Giedion and Philip Morton Shand. It was during this time that he followed closely the work of the main driving force behind the new modernism, Le Corbusier, and visited him in his Paris office several times in the following years. 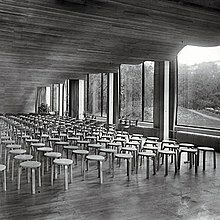 It was not until the completion of the Paimio Sanatorium (1932) and Viipuri Library (1935) that Aalto first achieved world attention in architecture. His reputation grew in the USA following the invitation to hold a retrospective exhibition of his works at the MOMA in New York in 1938, which was also the first time he visited the US. The significance of the exhibition - which afterwards went on a 12-city tour of the country - lies in the fact that he was only the second ever architect - after Le Corbusier - to have a solo exhibition at the museum. His reputation grew in the USA following the critical reception of his design for the Finnish Pavilion at the 1939 New York World's Fair, described by Frank Lloyd Wright as a "work of genius". It could be said that Aalto's international reputation was sealed with his inclusion in the second edition of Sigfried Giedion's influential book on Modernist architecture, Space, Time and Architecture: The growth of a new tradition (1949), in which Aalto received more attention than any other Modernist architect, including Le Corbusier. In his analysis of Aalto, Giedion gave primacy to qualities that depart from direct functionality, such as mood, atmosphere, intensity of life and even national characteristics, declaring that "Finland is with Aalto wherever he goes". During the 1930s Alvar spent some time experimenting with laminated wood, making sculptures, and abstract reliefs, characterized by irregular curved forms. Utilizing this knowledge he was able to solve technical problems concerning the flexibility of wood and also of working out spatial issues in his designs. Aalto's early experiments with wood and his move away from a purist modernism would be tested in built form with the commission to design Villa Mairea (1939) in Noormarkku, the luxury home of the young industrialist couple Harry and Maire Gullichsen. It was Maire Gullichsen who acted as the main client, and she worked closely not only with Alvar but also Aino Aalto on the design, inspiring them to be more daring in their work. The original design was to include a private art gallery, but this was never built. The building forms a U-shape around a central inner "garden" the central feature of which is a kidney-shaped swimming pool. Adjacent to the pool is a sauna executed in a rustic style, alluding to both Finnish and Japanese precedents. The design of the house is a synthesis of numerous stylistic influences, from traditional Finnish vernacular to purist modernism, as well as influences from English and Japanese architecture. While the house is clearly intended for a wealthy family, Aalto nevertheless argued that it was also an experiment that would prove useful in the design of mass housing. His increased fame led to offers and commissions outside Finland. In 1941 he accepted an invitation as a visiting professor to Massachusetts Institute of Technology in the USA. Because of the Second World War, he returned to Finland to direct the Reconstruction Office. After the war, he returned to MIT, where he designed the student dormitory Baker House, completed in 1949. The dormitory lay along the Charles River and its undulating form provided maximum view and ventilation for each resident. This building was the first building of Aalto's redbrick period. Originally used in Baker House to signify the Ivy League university tradition, on his return to Finland Aalto used it in a number of key buildings, in particular, in several of the buildings in the new Helsinki University of Technology campus (starting in 1950), Säynätsalo Town Hall (1952), Helsinki Pensions Institute (1954), Helsinki House of Culture (1958), as well as in his own summer house, the so-called Experimental House in Muuratsalo (1957). In the fifties Aalto immersed himself in his sculpting, be it with wood, bronze, marble, or mixed media. Among the notable works from this period is the memorial to the Battle of Suomussalmi (1960); located on the battlefield, it consists of a leaning bronze pillar on a pedestal. The early 1960s and 1970s (up until his death in 1976) were marked by key works in Helsinki, in particular the huge town plan for the void in centre of Helsinki adjacent to Töölö Bay and the vast railway yards, and marked on the edges by significant buildings such as the National Museum and the main railway station, both by Eliel Saarinen. In his town plan Aalto proposed a line of separate marble-clad buildings fronting the bay which would house various cultural institutions, including a concert hall, opera, museum of architecture and headquarters for the Finnish Academy. The scheme also extended into the Kamppi district with a series of tall office blocks. 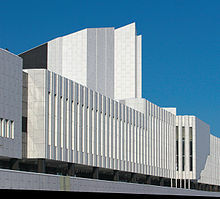 Aalto first presented his scheme in 1961, but it went through various modifications during the early 1960s. Only two fragments of the overall plan were ever realized: the Finlandia Hall concert hall (1976) fronting Töölö Bay, and an office building in the Kamppi district for the Helsinki Electricity Company (1975). The Miesian formal language of geometric grids employed in the buildings was also used by Aalto for other sites in Helsinki, including the Enso-Gutzeit building (1962), the Academic Bookstore (1962) and the SYP Bank building (1969). 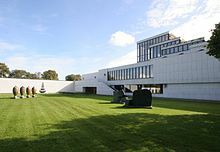 Following Aalto's death in 1976 his office continued to operate under the direction of his widow, Elissa, completing works already to some extent designed. These works include the Jyväskylä City Theatre and Essen opera house. Since the death of Elissa Aalto the office has continued to operate as the Alvar Aalto Academy, giving advice on the restoration of Aalto buildings and organising the vast archive material. 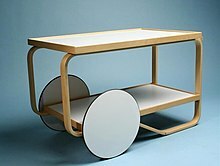 Whereas Aalto was famous for his architecture, his furniture designs were well thought of and are still popular today. He studied Josef Hoffmann and the Wiener Werkstätte, and for a period of time, worked under Eliel Saarinen. He also gained inspiration from Gebrüder Thonet. During the late 1920s and 1930s he, working closely with Aino Aalto, also focused a lot of his energy on furniture design, partly due to the decision to design much of the individual furniture pieces and lamps for the Paimio Sanatorium. Of particular significance was the experimentation in bent plywood chairs, most notably the so-called Paimio chair, which had been designed for the sitting tuberculosis patient. The Aaltos, together with visual arts promoter Maire Gullichsen and art historian Nils-Gustav Hahl founded the Artek company in 1935, ostensibly to sell Aalto products but also other imported products. He became the first furniture designer to use the cantilever principle in chair design using wood. Aalto's awards included the Prince Eugen Medal in 1954, the Royal Gold Medal for Architecture from the Royal Institute of British Architects in 1957 and the Gold Medal from the American Institute of Architects in 1963. He was elected a Foreign Honorary Member of the American Academy of Arts and Sciences in 1957. He also was a member of the Academy of Finland, and was its president from 1963 to 1968. From 1925 to 1956 he was a member of the Congrès International d'Architecture Moderne. In 1960 he received an honorary doctorate at the Norwegian University of Science and Technology (NTNU). Aalto's career spans the changes in style from (Nordic Classicism) to purist International Style Modernism to a more personal, synthetic and idiosyncratic Modernism. Aalto's wide field of design activity ranges from the large scale of city planning and architecture to interior design, furniture and glassware design and painting. It has been estimated that during his entire career Aalto designed over 500 individual buildings, approximately 300 of which were built, the vast majority of which are in Finland. He also has a few buildings in France, Germany, Italy and the USA. Aalto's work with wood, was influenced by early Scandinavian architects; however, his experiments and departure from the norm brought attention to his ability to make wood do things not previously done. His techniques in the way he cut the beech tree, for example, and also his ability to use plywood as structural and aesthetic. Other examples include the rough-hewn vertical placement of logs at his pavilion at the Lapua expo, looking similar to a medieval barricade, at the orchestra platform at turku and the Paris expo at the World Fair, he used varying sizes and shapes of planks. Also at Paris and at Villa Mairea he utilized birch boarding in a vertical arrangement. Also his famous undulating walls and ceilings made of red pine. In his roofing, he created massive spans (155-foot at the covered statium at Otaniemi) all without tie rods. His stairway at Villa Mairea, he evokes feelings of a natural forest by binding beech wood with withes into columns. Aalto claimed that his paintings were not made as individual artworks but as part of his process of architectural design, and many of his small-scale "sculptural" experiments with wood led to later larger architectural details and forms. These experiments also led to a number of patents: for example, he invented a new form of laminated bent-plywood furniture in 1932 (which was patented in 1933). His experimental method had been influenced by his meetings with various members of the Bauhaus design school, especially László Moholy-Nagy, whom he first met in 1930. Aalto's furniture was exhibited in London in 1935, to great critical acclaim, and to cope with the consumer demand Aalto, together with his wife Aino, Maire Gullichsen and Nils-Gustav Hahl founded the company Artek that same year. Aalto glassware (Aino as well as Alvar) is manufactured by Iittala. Aalto's 'High Stool' and 'Stool E60' (manufactured by Artek) are currently used in Apple Stores across the world to serve as seating for customers. Finished in black lacquer, the stools are used to seat customers at the 'Genius Bar' and also in other areas of the store at times when seating is required for a product workshop or special event. Aalto was also influential in bringing modern art to the knowledge of the Finnish people, in particular the work of his friends, Alexander Milne Calder and Fernand Léger. Church of Santa Maria Assunta, Riola of Vergato, Italy, designed in 1966 and built 1975-1978. Photo by Paolo Monti, 1980. For a more comprehensive list, see List of Alvar Aalto's works. 1963-1968: Church of St Stephen (Stephanus Kirche), Detmerode, Wolfsburg, Germany. "God created paper for the purpose of drawing architecture on it. Everything else is at least for me an abuse of paper." Alvar Aalto, Sketches, 1978, 104. "We should work for simple, good, undecorated things" and he continues, "but things which are in harmony with the human being and organically suited to the little man in the street." Alvar Aalto, speech in London 1957. As already mentioned, Aalto's international reputation was sealed with his inclusion in the second edition of Sigfried Giedion's influential book on Modernist architecture, Space, Time and Architecture: The growth of a new tradition (1949), in which Aalto received more attention than any other Modernist architect, including Le Corbusier. In his analysis of Aalto, Giedion gave primacy to qualities that depart from direct functionality, such as mood, atmosphere, intensity of life and even national characteristics, declaring that "Finland is with Aalto wherever he goes". However, a few more recent architecture critics and historians have questioned Aalto's position of influence in the canonic history. Italian Marxist architecture historians Manfredo Tafuri and Francesco Dal Co put forward the viewpoint that Aalto's "historical significance has perhaps been rather exaggerated; with Aalto we are outside of the great themes that have made the course of contemporary architecture so dramatic. The qualities of his works have a meaning only as masterful distractions, not subject to reproduction outside the remote reality in which they have their roots." Their viewpoint was propounded by their own priority given to urbanism, seeing Aalto as an anti-urban, and thus consequently disparaging what they regarded as peripheral non-urban areas of the world: "Essentially his architecture is not appropriate to urban typologies." Similarly concerned with the appropriateness of Aalto's form language, at the other end of the political spectrum, American postmodernist critic Charles Jencks made a claim for the need for buildings to signify meaning; however, he then lifted out Aalto's Pensions Institute building as an example of what he termed Aalto's 'soft paternalism': "Conceived as a fragmented mass to break up the feeling of bureaucracy, it succeeds all too well in being humane and killing the pensioner with kindness. The forms are familiar red brick and ribbon-strip windows broken by copper and bronze elements – all carried through with a literal-mindedness that borders on the soporific." But also during Aalto's lifetime he faced critique from his fellow architects in Finland, most notably Kirmo Mikkola and Juhani Pallasmaa; by the last decade of his life Aalto's work was seen as idiosyncratic and individualistic, when the opposing tendencies of rationalism and constructivism – often championed under left-wing politics – argued for anonymous virtually non-aesthetic architecture. Mikkola wrote of Aalto's late works: "Aalto has moved to his present baroque line..."
Alvar Aalto is the eponym of the Alvar Aalto Medal, now considered[by whom?] one of world architecture's most prestigious awards. Aalto was featured in the 50 mk note in the last series of the Finnish markka (before its replacement by the Euro in 2002). The centenary of Aalto's birth in 1998 was marked in Finland not only by several books and exhibitions, but also by the promotion of specially bottled red and white Aalto Wine and a specially designed cupcake. In 1976, the year of his death, Aalto was commemorated on a Finnish postage stamp. Aalto University, a Finnish university formed by merging Helsinki University of Technology, Helsinki School of Economics and TaiK in 2010, is named after Alvar Aalto. An Alvar Aallon katu (Alvar Aalto Street) can be found in five different Finnish cities: Helsinki, Jyväskylä, Oulu, Kotka and Seinäjoki. ^ Heilig-Geist-Kirchengemeinde bei kirche-wolfsburg.de, retrieved 27 February 2018. ^ Guimaraes, M. (2012). "A precedent in sustainable architecture: Alvar Aalto's summer house". Journal of Green Building. 7 (2): 64–73. Aalto, Alvar (1998). Schildt, Goran (ed.). Alvar Aalto in His Own Words. Helsinki, Finland: Rizzoli. ISBN 978-0847820801. Alvar Aalto Museum (2011). "Alvar Aalto Museo" [Alvar Aalto Museum]. www.alvaraalto.fi. Anderson, Stanford (2013). Fenske, Gail; Fixler, David (eds.). Aalto and America. Cambridge, MASS: MIT Press. ISBN 9780300176001. Anon (2014). "Honorary Doctors". NTNU (in Norwegian). Archived from the original on 10 September 2014. Retrieved 10 September 2014. Anon (2013). "Alvar Aalto : architect biography". architect.architecture.sk. Architecture.sk. Anon. "Biography Alvar Aalto 1898–1976" (PDF). Vitra Design Museum. Boyce, Charles (1985). "Aalto, Hugo Alvar Henrik (1899–1976)". Dictionary of Furniture. New York, NY: Henry Holt and Co. ISBN 0-8050-0752-0. Brown, Theodore M. (1969). "Alto, Hugo Alvar Henrik". In Myers, Bernard S. (ed.). McGraw-Hill Dictionary of Art. I: AA-Ceylon. New York, NY: McGraw-Hill Book Company. LCCN 68026314. Chilvers, Ian, ed. (2004) . "Aalto, Alvar". The Oxford Dictionary of Art (3rd ed.). Oxford, UK: Oxford University Press. ISBN 0-19-860476-9. Enckell, Ulla (1998). Alvar Aalto: Taiteilija - Konstnären - The Artist. Helsinki: Amos Anderson Museum. ISBN 952-9531-25-7. Heporauta, Arne (1999). Alvar Aalto: Arkkitehti / Architect 1898–1976 (in Finnish) (1st ed.). Helsinki, Finland: Rakennustieto. ISBN 951-682-546-X. Eisenbrand, Jochen, ed. (2014). Alvar Aalto - Second Nature. Weil am Rhein: Vitra Design Museum. ISBN 978-3-931936-93-8. Hipeli, Mia, ed. (2014). Paimio Sanatorium 1929-33: Alvar Aalto Architect Volume 5. Helsinki: Alvar Aalto Foundation. ISBN 978-952-267-074-8. Holma, Marjo, ed. (2015). House of Culture. 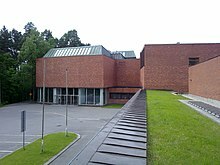 Jyväskylä: Alvar Aalto Museum. Jencks, Charles (1973). Modern Movements in Architecture. Garden City, NY: Anchor Press. ISBN 978-0385025546. Kairamo, Maija, ed. (2009). Alvar Aalto Library in Vyborg: Saving a Modern Masterpiece. Helsinki: Rakennustieto. ISBN 978-951-682-938-1. Korvenmaa, Pekka, ed. (2004). Sunila 1936-54: Alvar Aalto Architect Volume 7. Helsinki: Alvar Aalto Foundation. ISBN 952-5498-03-4. Laaksonen, Esa, ed. (2008). Maison Louis Carré 1956-61: Alvar Aalto Architect Volume 20. Helsinki: Alvar Aalto Foundation. ISBN 978-952-5371-43-7. Labò, Mario (1968) . "Aalto, Hugo Alvar Henrik". In Crandall, Robert W. (ed.). Encyclopedia of World Art. I: Aalto-Asia Minor, Western. New York, NY: McGraw Hill Book Company, Inc. LCCN 59013433. McCarter, Robert (2006). Frank Lloyd Wright. London: Reaktion Books. ISBN 978-1861892683. Mikkola, Kirmo (1969). "Suomalaisen arkkitehtuurin ajankohtaista pyrkimyksiä". Arkkitehti (in Finnish). 66: 30–37. Paatero, Kristiina, ed. (1993). The Line - Original Drawings from the Alvar Aalto Archive. Helsinki: Alvar Aalto Foundation. ISBN 951-9229-81-7. Paavilainen, Simo, ed. (1982). Nordisk Klassicism – 1910–1930 [Nordic Classicism]. Helsinki: Museum of Finnish Architecture. ISBN 951-9229-21-3. Pallasmaa, Juhani (1998). Alvar Aalto: Villa Mairea 1938–39 (2nd ed.). Ram Pubns & Dist. ISBN 978-9525371314. Pelkonen, Eeva-Liisa (2009). Alvar Aalto: Architecture, Modernity, and Geopolitics. New Haven, CT: Yale University Press. ISBN 978-0300114287. Schildt, Göran (1994). Alvar Aalto, A life's work: Architecture, Design and Art. Helsinki, Finland: Otava Pub. Co. ISBN 978-9511129752. Suominen-Kokkonen, Renja (2007). Aino and Alvar Aalto – A Shared Journey – Interpretations of an everyday modernism. Helsinki: Alvar Aalto Foundation. ISBN 978-9525371321. Tafuri, Manfredo; Co, Francesco Dal (1976). Architettura contemporanea [Modern Architecture] (in Italian). Milan: Electa. Thorne, John, ed. (1984). "Aalto, Alvar". Chambers Biographical Dictionary (Revised ed.). Chambers. ISBN 0-550-18022-2. Weston, Richard (1997) . Alvar Aalto. London, UK: Phaidon Press Limited. ISBN 978-0714837109. Tourney, Michele (2013). "Book of Members, 1780–2010: Chapter A" (PDF). American Academy of Arts and Sciences. Retrieved 13 November 2013. Göran Schildt has written and edited many books on Aalto, the most well-known being the three-volume biography, usually referred to as the definitive biography on Aalto. Schildt, Göran (1984). Alvar Aalto. The Early Years. New York, NY: Rizzoli. ISBN 978-0847805310. Schildt, Göran (1987). Alvar Aalto. The Decisive Years. New York, NY: Rizzoli. ISBN 978-0847807116. Schildt, Göran (1991). Alvar Aalto. The Mature Years. New York, NY: Rizzoli. ISBN 978-0847813292. Alvar Aalto Archive Staff (1994). The Architectural Drawings of Alvar Aalto 1917–1939: Aalto's Own Home in Helsinki, the Finnish Pavilion at the 1937 World's Fair in Paris, and Other Buildings and Projects, 1932–1937. Garland Architectural Archives. Routledge. Schildt, Göran (1994). Alvar Aalto: The Complete Catalogue of Architecture, Design and Art. New York, NY: Rizzoli. ISBN 978-0847818181. Laaksonen, Esa (2013). Alvar Aalto Architect. 5: Paimio Sanatorium 1928–32. Rakennustieto Publishing. ISBN 978-9516829541. Holma, Maija; Pallasmaa, Juhani; Suominen-Kokkonen, Renja (2003). Alvar Aalto Architect. 6: The Aalto House 1935–36. Alvar Aalto Foundation. ISBN 978-9525498011. Korvenmaa, Pekka, ed. (2007). Alvar Aalto Architect. 7: Sunila 1936–1954. Alvar Aalto Foundation. ISBN 978-9525498035. Aalto, Alvar (2008). Alvar Aalto Architect. 13: University of Technology, Otaniemi 1949–74. Alvar Aalto Foundation. ISBN 978-9525498080. Hipeli, Mia (2009). Alvar Aalto Architect. 16: Jyväskylä University 1951–71. ASIN B002QH2LMK. Aalto, Alvar (2008). Alvar Aalto Architect. 20: Maison Louis Carre 1956–63. Alvar Aalto Foundation. ISBN 978-9525498066. Heporauta, Arne (1998). Alvar Aalto Arkkitehti: 1898–1976 (in Finnish). Helsinki, Finland: Rakennustieto Oy. ISBN 978-9516825468. Fleig, Karl (1975). Alvar Aalto. Praeger Publishers. ISBN 978-0275496609. Pearson, Paul David (1978). Alvar Aalto and the International Style. New York: Whitney Library of Design. ISBN 0-8230-7023-9. Porphyrios, Demetri (1982). Sources of Modern Eclecticism. St. Martin's Press. ISBN 978-0312746735. Pallasmaa, Juhani (1985). Aalto: Alvar Aalto Furniture. MIT Press. ISBN 978-0262132060. Korvenmaa, Pekka; Treib, Marc (2002). Reed, Peter (ed.). Alvar Aalto: Between Humanism and Materialism. New York, NY: The Museum of Modern Art. ISBN 978-0870701078. Quantrill, Malcolm (1983). Alvar Aalto: A Critical Study. Secker & Warburg. ISBN 0941533352. Ruusuvuori, Aarno, ed. (1978). Alvar Aalto 1898–1976. Helsinki, Finland: The Museum of Finnish Architecture. ASIN B0000ED4GS. Jormakka, Kari; Gargus, Jacqueline; Graf, Douglas The Use and Abuse of Paper. Essays on Alvar Aalto. Datutop 20: Tampere 1999. Connah, Roger (2008). Aaltomania. Rakennustieto Publishing. ISBN 978-9516826137. The extensive archives of Alvar Aalto are nowadays kept at the Alvar Aalto Museum, Jyväskylä, Finland. Material is also available from the former offices of Aalto, at Tiilimäki 20, Helsinki, nowadays the headquarters of the Alvar Aalto Foundation. Since 1995 the Alvar Aalto Museum and Aalto Academy has published a journal, Ptah, which is devoted not only to Aalto scholarship but also to architecture generally as well as theory, design and art. Alvar Aalto Foundation Custodian of Aalto's architectural drawings and writings. Institute of International Education, Kaufmann Conference Rooms architectural drawings and papers, 1961-1966.Held by the Department of Drawings & Archives, Avery Architectural & Fine Arts Library, Columbia University. Modern Furniture and the history of Moulded Plywood Role played by Alvar Alto in the use of Moulded plywood for furniture. Alvar Aalto in German, French and Italian in the online Historical Dictionary of Switzerland. "Alvar Aalto and Solar Geometry". solarhousehistory.com. Artek.fi, Aalto furniture; company founded by Aalto. Between Humanism and Materialism New York Museum of Modern Art exhibit site. Contains an especially useful timeline of his life and career. Checkonsite.com – Alvar Aalto architecture guide.